Weather Rain until this afternoon, starting again tonight, and windy starting this afternoon, continuing until this evening. Description For boats with draws less that 4' and vertical clearance under 25', The Cove offers a good anchorage in Tiverton where anchoring is unwise for the most part. This anchorage has good holding in mud. No reviews yet! 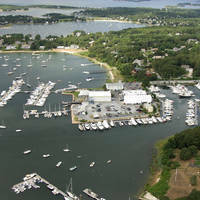 Be the first to write a review of The Cove Anchorage.